There is little doubt that the inerrancy of the Bible is a current and often contentious topic among evangelicals. 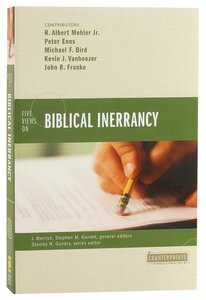 Five Views on Biblical Inerrancy represents a timely contribution by showcasing the spectrum of evangelical positions on inerrancy, facilitating understanding of these perspectives, particularly where and why they diverge. Each essay in Five Views on Biblical Inerrancy considers: the present context and the viability and relevance for the contemporary evangelical Christian witness; whether and to what extent Scripture teaches its own inerrancy; the position's assumed/implied understandings of the nature of Scripture, God, and truth; and three difficult biblical texts, one that concerns intra-canonical contradictions, one that raises questions of theological plurality, and one that concerns historicity. Five Views on Biblical Inerrancy serves not only as a single-volume resource for surveying the current debate, but also as a catalyst both for understanding and advancing the conversation further. Contributors include Al Mohler, Kevin Vanhoozer, Michael Bird, Peter Enns, and John Franke. About "Five Views on Biblical Inerrancy (Counterpoints Series)"
R. Albert Mohler Jr (Ph.D., Southern Baptist Theological Seminary) is the Joseph Emerson Brown Professor of Christian Theology and President of The Southern Baptist Theological Seminary, one of the largest seminaries in the world. Dr. Mohler has been recognized by influential publications such as Time and Christianity Today as a leader among American evangelicals. In fact, Time.com called him the reigning intellectual of the evangelical movement in the U.S.
Dr. Mohler hosts a daily live nationwide radio program on the Salem Radio Network. He also writes a popular blog and a regular commentary on moral, cultural and theological issues. He is a frequent guest on national and international news outlets and is a popular preacher, teacher and lecturer. He is also the author of Cultural Shift: Engaging Current Issues with Eternal Truths; Preaching: The Centrality of Scripture and most recently The Disappearance Of God. Kevin J. Vanhoozer (Ph.D., Cambridge University) is Research Professor of Systematic Theology at Trinity Evangelical Divinity School in Deerfield, Illinois, from 1990-1998 was senior lecturer in theology and religious studies at New College, University of Edinburgh, in Edinburgh, Scotland. He has written Biblical Narrative in the Philosophy of Paul Ricoeur (Cambridge University Press), Is There a Meaning in This Text? (Zondervan), The Drama of Doctrine: A Canonical-Linguistic Approach to Christian Theology (Westminster John Knox). He is the editor of the Cambridge Companion to Postmodern Theology (Cambridge University Press), The Dictionary for Theological Interpretation of the Bible (Baker). His most recent publications are First Theology: God, Scripture and Hermeneutics (Intervarsity Press), Remythologizing Theology: Divine Action, Passion, and Authorship. (Cambridge University Press) and Jeremiah (Brazos Theological Commentary on the Bible). John R. Franke, (D.Phil. University of Oxford) is Professor of Theology at Biblical Theological Seminary, Hatfield PA. Dr. Franke is particularly interested in engaging postmodern thought and culture from the perspective of Christian faith in order to explore the opportunities and challenges they present for the witness and ministry of the gospel. In addition to teaching at Biblical, he has lectured and taught on the relationships between theology, ministry, and postmodernity in the United States, Canada, England, and New Zealand and is actively involved in research and writing. In addition to publishing numerous articles and reviews, he is the co-author of Beyond Foundationalism: Shaping Theology in a Postmodern Context and the author of The Character of Theology and Barth for Armchair Theologians.